Living statue in the Venetian display in Las Vegas. I thought it was plaster! 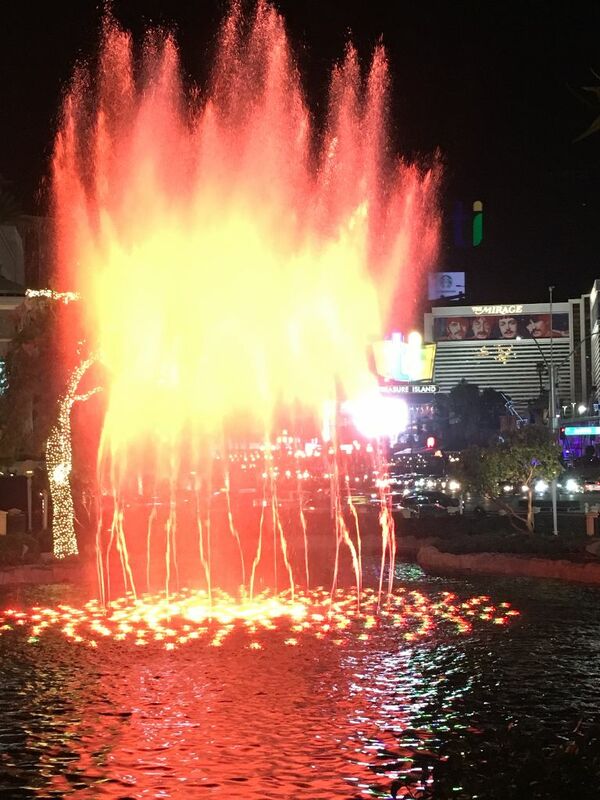 Even though Hippocrates would have been appalled and Ms. Keller would have been unable to see the bright lights or wild color displays of the fountains and glittery signs, Las Vegas is an astonishing place. Much of what we saw was a tribute to art. I expected to be overwhelmed by the glitz, glamour and materialism in Las Vegas Nevada last weekend. And I was. Wretched excess was on display at every turn. The water wasted in the fountains was poisonous to the environmentalist in my heart. One of the stunning light and water shows outside of the theater where we saw Le Reve by Cirque du Soleil. 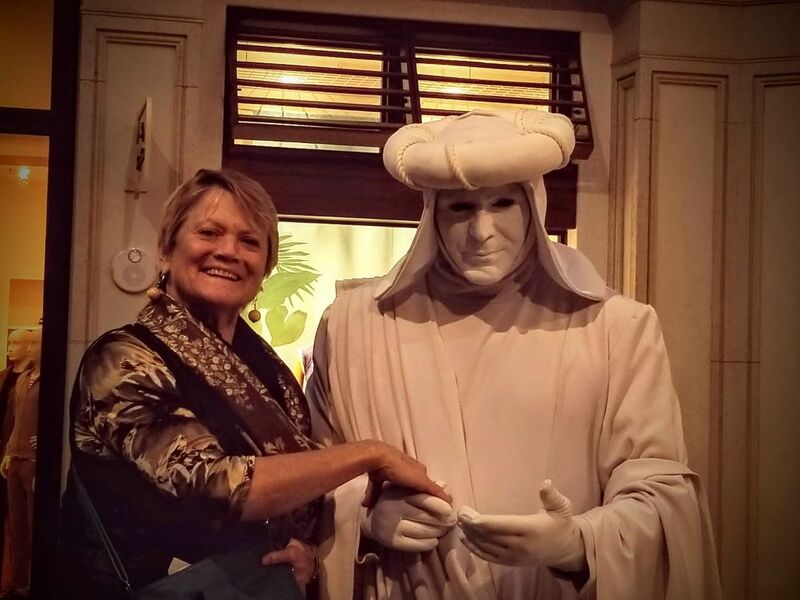 And yet there were so many fabulous visual experiences: fire-burst fountains of changing color, beautiful faux skies on soaring ceilings, living statues. High end galleries displaying Chagall, Warhol and many more fabulous works. We walked through perfect 1/2 sized reproductions of New York streets… at the corner of Broadway and Greenwich; Paris at the foot of the Eiffel Tower; and Venetian walkways at the side of the canals. 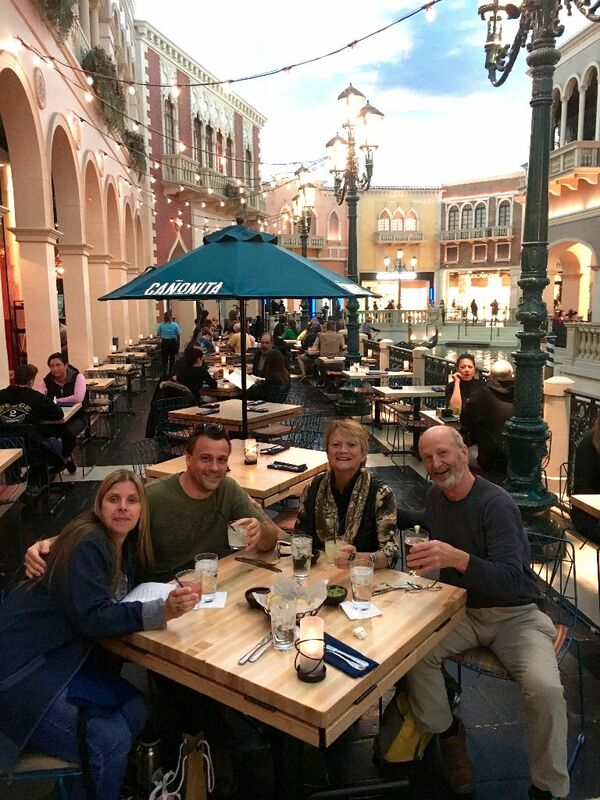 Jim and I lunching in the Venetian Palace with Emily and Russell. Next to us was a canal with gondolas and gondoliers. The art and architecture was faithful to the originals and a tribute to arts of the ages. 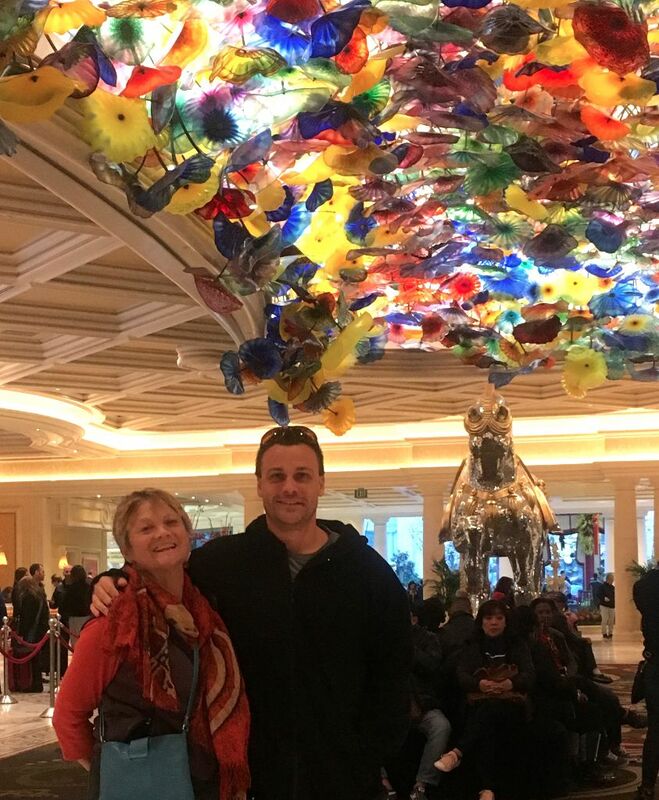 Russell and I beneath a dazzling Chihuly display at the Bellagio Hotel. I was there for a conference for the Society of Children’s Book Writers and Illustrators. Serendipitously Andrew Russell Towl was there with his life’s companion, Emily Boirum who had a conference there as well. Since they live in Honolulu we don’t get to see them very often. It was wonderful to have them as guides through the maze of fascinating, exotic buildings, installations and displays. We even went to Le Reve, a Cirque du Soleil performance. Yes, there were casinos with haggard people hunched over the slots clutching cigarettes and cigars. Yes, I gambled $3.00 and lost it all! But there are two sides to everything. One can see beauty or ugliness. I’ve never been there, but now I have a different idea about it. It’s so cool that you were there at the same time as Russell and Emily. I want to hear about what you learned at the conference, too.